Lovely mountain contemporary. 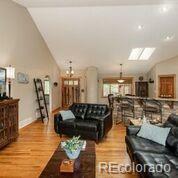 Open floor plan with remodeled kitchen, adjoining breakfast nook and vaulted living room all open to one another. Corner gas fireplace with stone surround, deck access and hardwood flooring are special features enhancing the far-reaching mountain views of the private treed location. Two secondary main level bedrooms with roomy closets share a full bath. Main level master has new 5-piece bath, big walk-in closet and deck access. Walk-out level includes a family room with wet bar and deck access, three bedrooms and a full bath. Fabulous privacy within the trees, plus great views and access to Three Sister's Open Space all within easy reach of Evergreen schools and the heart of Evergreen make this a special offering on today's market. Seller provided a credit of approx. $8,000 to the Buyer for roof replacement.